Each year, I-House proudly celebrates and honors distinguished individuals who embody our mission to promote a world of greater understanding and peace. See below for more Gala event details. Hello friends! The semester is winding down, and I know that a lot of people (myself included) are trying to make the most of living in Berkeley and I-House before having to leave. If you’ve spent most of your time here studying and hustling, then take a break, and check out some of my personal favorite Berkeley sights! International House is, in my humble opinion, the best residence for students attending UC Berkeley. The location, view, and amenities are fantastic, and the people are, of course, wonderful. Below is how my typical week at I-House plays out. Let us know in the comments below what your week is like. Happy spring, everyone! this room has such good acoustics – perfect for blasting workout music! After waking up and grabbing a tea or coffee from the dining commons, I rush off to campus. My day is full of classes, lab, and work, but I come back in time for dinner with some friends. After chatting about cultural differences and our weekend plans, I excuse myself and make my way to the Chevron Auditorium. On Mondays, from 7-8 pm, there is a free yoga class for residents, and from 8-9 pm, there is a free Zumba class. After a long day, some physical exercise is very welcome, and the instructors are very kind and funny! Thank you to all who participated in this year’s Big Give for International House on Thursday, March 14th! You truly helped I-House “seize the moment” and made a big difference in the lives of our residents. By exceeding the ambitious goal of 150 gifts and ending the day with 175 gifts, we received $3,000 in matching challenge funds from our I-House Big Match donors. 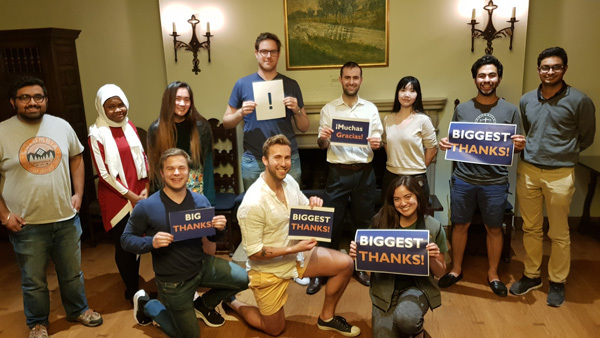 Thanks to the efforts of resident volunteers and the I-House Resident Council (pictured above), we received a record number of gifts from current residents. I-House won an additional $4,000 campus prize in the Raising the Bar challenge because of the impressive increase over last year’s 104 gifts. Today’s the day! Help us reach our matching challenge goals by making a gift now. If you already made a gift, we thank you! All gifts to I-House during the Big Give make an even greater impact. If we make our goal of 150 gifts, I-House will receive an additional $3,000 because of our challenge match. Help us get there by making a gift to I-House at ihouse.berkeley.edu/biggive2019 by 9 pm PST tonight. Check our progress on the Big Give Leaderboards. We think the residents did a great job. If you agree, please give it a “Thumbs Up” and share it with your networks! Forward this email to friends, and share the I-House love! Make a gift of $10 or more to I-House until 9 pm PST on March 14th at ihouse.berkeley.edu/biggive2019. Just fill in the blank. The most inspirational post all day wins! UC Berkeley’s Big Give, a 24-hour online fundraising blitz starts now! Your online gift will go a long way to help us reach our goal of 150 gifts in 24 hours. International gifts made now through 6 a.m. will increase our odds to win an additional $1,500 for I-House for the random international donor contest in the Big Countdown! So, whatever time zone you are in, make a gift to I-House at ihouse.berkeley.edu/biggive2019. If you already made a gift, we thank you! Your support will benefit The Fund for I-House, a valuable resource that provides for life-changing scholarships, inspirational programming, and preservation of our historic home.